Lt. Chad Swank demonstrates how he uses his 100 pounds of gear. 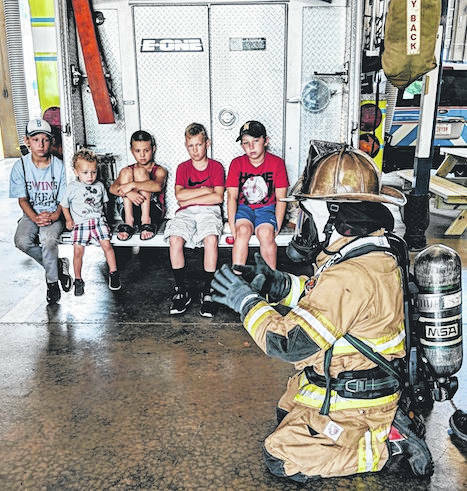 MOUNT GILEAD — The village’s Fire Department hosted the Morrow County Community Center’s Moms and Kids program Thursday morning. Kids climbed on a fire truck and got a close look at the firemen’s gear. While the moms exercised at the Morrow County Community Center Gym, their children got a look inside a fire truck with Lt. Chad Swank and Captain Mark Carey of the fire department. Rhonda and Pete Dettra, along with Gail West, are leaders for the Morrow County Community Center’s children’s programs this summer. Most of the programs are held at the Mount Gilead Library and the trip to the fire station was one of the “walking field trips” the children will take part in this summer. Lt. Swank showed the children each part of his 100 pounds of gear and how it’s used. He also gave them a little history lesson on the fireman hat, which was first designed by Benjamin Franklin. Rhonda and Pete were happy to see how absorbed the children were with the fireman’s talk. Each child got a goody bag, courtesy of the fire department. It was complete with stickers, magnets, coloring sheets and booklets on fire safety. Children then continued to the new Cherry Street playground to enjoy playing for 20 minutes. The moms and Kids program will continue from July 10-31. Programs are from 9-10 a.m. on Tuesdays and Thursdays with moms at the Community Center Gym in an exercise program with Caitlin Trainer. Kids enjoy a creative story hour time and crafts with the Dettras at the library. July program themes include: Bubbles, rod and reel, Skittle sort, Lego building and more. For information about Morrow County Community Center programs the website is www.mccommunitycenter.org. The Morrow County Community Center Gym is at 16 S. Main St., Mount Gilead. There is still time to sign up for the Sweetcorn Festival 5/10 K Run on Saturday, July 21 at 9 a.m.